Satellite images reveal that a 13,680 sq.km (5,282 sq.mile) ice shelf has begun to collapse because of rapid climate change in a fast-warming region of Antarctica. 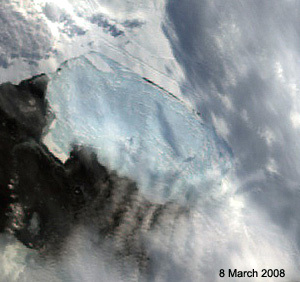 The Wilkins Ice Shelf is a plate of permanent floating ice on the southwest Antarctic Peninsula. The western Antarctic Peninsula has had the biggest temperature increase on Earth in the last 50 years, rising 0.5°C (0.9 °F) each decade. 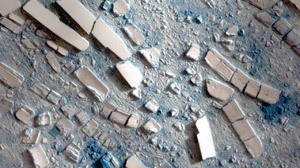 NSIDC Lead Scientist Ted Scambos, who first spotted the disintegration in March, said, "We believe the Wilkins has been in place for at least a few hundred years. But warm air and exposure to ocean waves are causing a break-up." This latest ice shelf collapse is a strong indication that global warming is changing Antarctic ice faster than prevously predicted. The Wilkins Ice Shelf began its collapse on February 28th when a large iceberg, 41 by 2.5 kilometers (25.5 by 1.5 miles), fell away from the southwestern front, triggering a runaway disintegration of 570 sq.km (220 sq.miles) of the shelf interior (images right). A narrow beam of intact ice, just 6 km (3.7 miles) wide was protecting the remaining shelf from further breakup as of March 23 (image bottom right and below). Ice shelves hold back glaciers, which if unleashed, can accelerate and raise sea level. Scambos said, "The Wilkins disintegration won't raise sea level because it already floats in the ocean, and few glaciers flow into it." "However, the collapse underscores that the Wilkins region has experienced an intense melt season. Regional sea ice has all but vanished, leaving the ice shelf exposed to the action of waves." 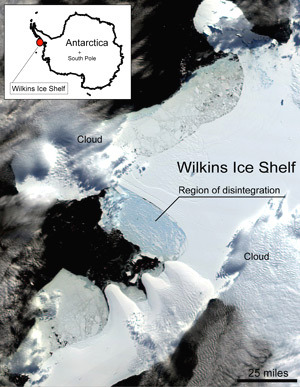 With Antarctica's summer melt season drawing to a close, scientists do not expect the Wilkins to further disintegrate in the next several months. "This unusual show is over for this season," Scambos said. 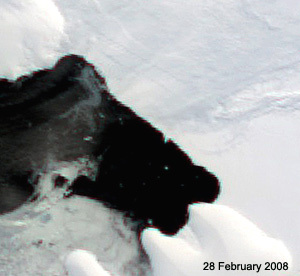 Above: Arial photo from an aircraft of the sudden, massive break-up of the Wilkins Ice Shelf. Professor David Vaughan of BAS predicted in 1993 that the northern part of the Wilkins Ice Shelf was likely to be lost by 2024 if warming on the Peninsula were to continue at the same rate. He says, "Wilkins is the largest ice shelf on the Antarctic Peninsula yet to be threatened. I didn't expect to see things happen this quickly. The ice shelf is hanging by a thread." 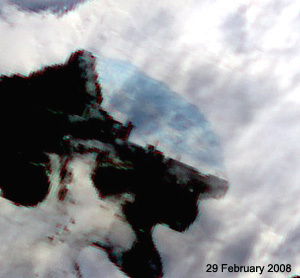 Below: A close-up satellite image covering one-mile (1800 metres) by 2 miles (3200 metres) of the broken up portion of the Wilkins Ice Shelf. Image, NSIDC/Courtesy of Cheng-Chien Liu/NSPO. Copyright © 2008 TerraNature Trust. All rights reserved.